The kitchen is the type of place where things get out of order all the time. Keeping it organized is a challenge but it‘s possible! I think you can never have too much storage space in the kitchen. However, having too little of it can be a real problem! Today I‘m sharing multiple DIY kitchen organization ideas that might give you a little bit of inspiration on how to keep the best place at home clean and organized! We often forget to use the corners of the kitchen or just the sides of the furniture. When your kitchen is spacious adding little details to the furniture can be game changing! Get a wood trim that suits the color of your furniture and attach it to one of the cupboards. Hammer a few nails into it and hang your pots and cutting boards. In this way, you‘re going to be using the sides of furniture that would otherwise stay empty! Also, it gives the kitchen‘s decor a little bit of a twist that no one will expect. 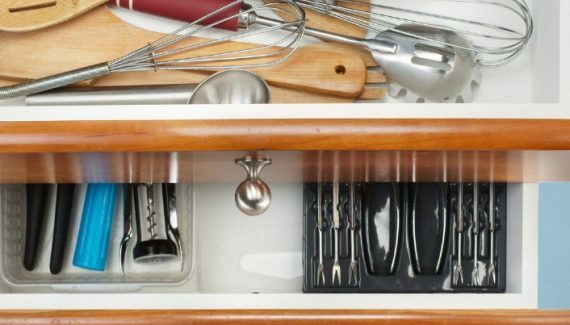 Learn more about kitchen cabinet organization here! If you‘re my kind of person and believe that spices are essential to eating delicious food, then you‘ll love this idea. 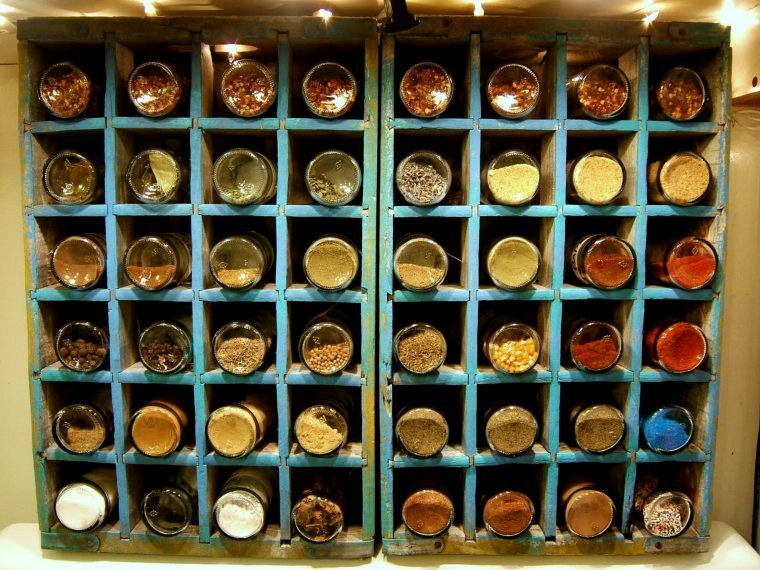 Especially if you are at that point in your life where collecting spices isn‘ really new to you anymore. You know the vintage wooden crates that have been so popular back in the days? I‘m not sure whether they‘re still around but you might as well just have a few in your garage. Anyway, if you don‘t, I‘ve seen a bunch on Etsy, check them out here. You can transform one into a beautiful spice rack. All, you need is a little bit of paint, a few nails, and some passion! Now, I‘ve absolutely loved this idea! Mostly because you don‘t need to be a DIY guru to make this one happen. 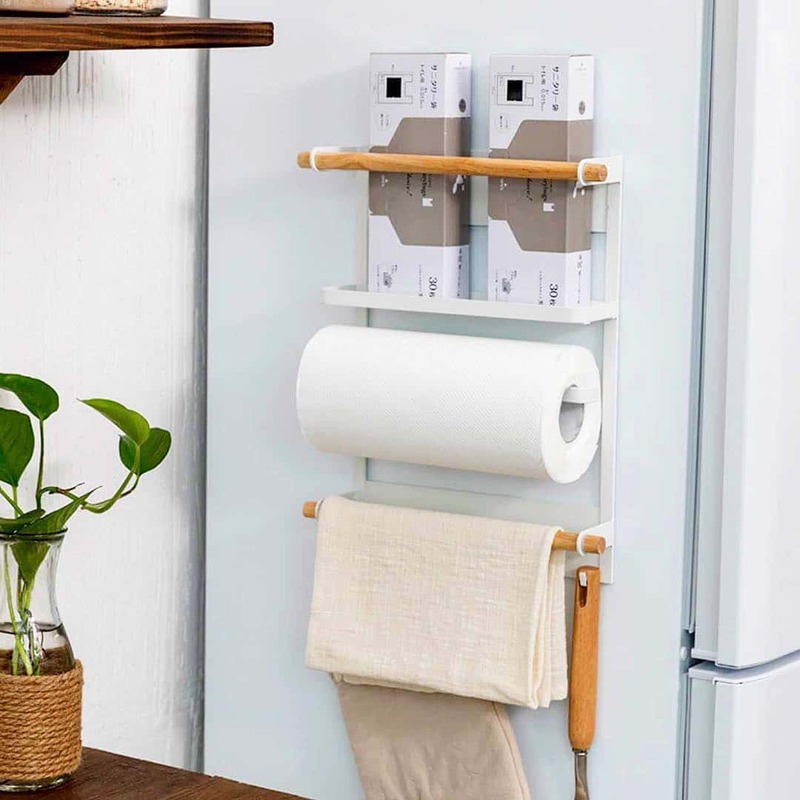 Make your own hidden kitchen organizer and have all the important things – pictures, keys, shopping lists attached to it. All you need for this one is a cupboard, a few sheets of metal, some glue, shelf liner, and imagination! Feel free to attach an important letter, bills and plan sheets to it with clips. If your vegetables constantly go bad and storing them is just hard, you might love this idea! You‘ll need a little bit of wood work right here but it‘s nothing too difficult. 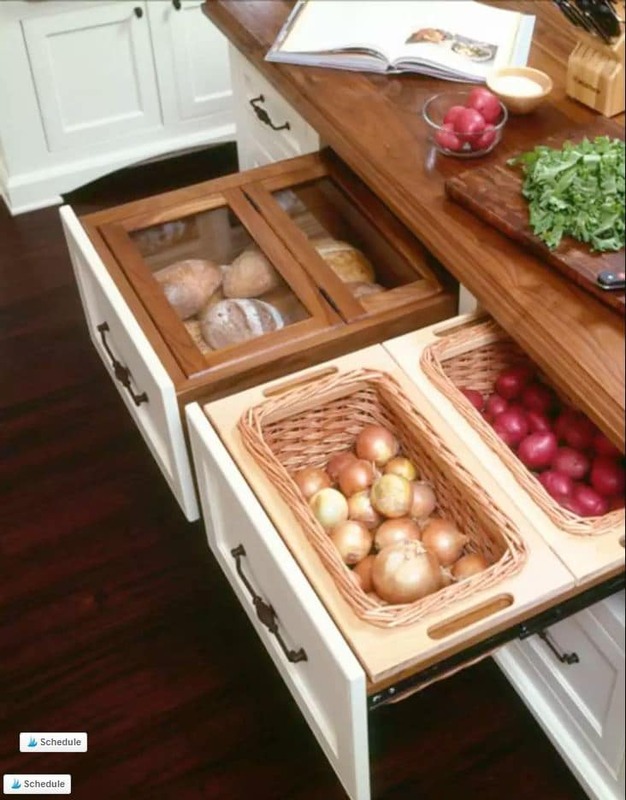 You can transform your regular drawers into vegetable-friendly storage units! 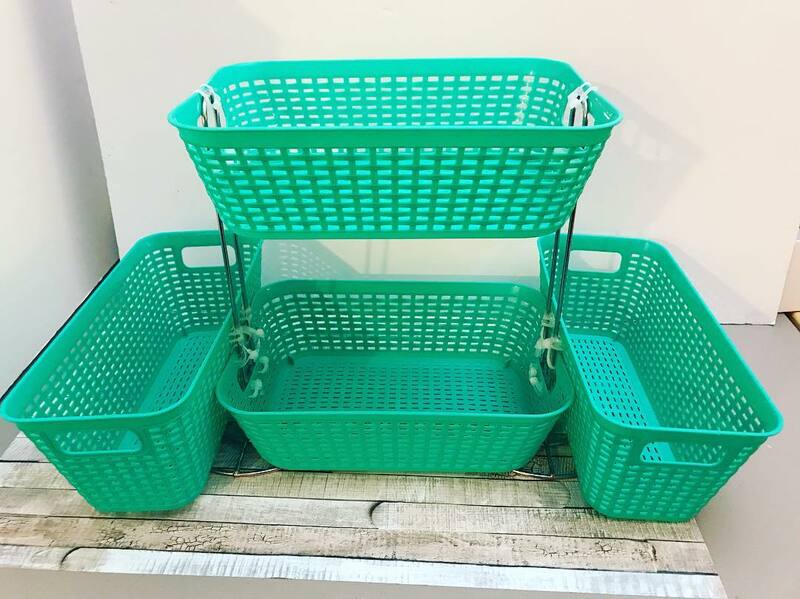 You‘ll need wicker baskets that have nice little edges (like these ones here). The sturdier the better! The tricky part here is to make sure that the basket isn‘t too short nor too tall, just right for the drawer. On the top of the drawer, you have the wooden boards that sort of keep everything in place. You can make those or try to find wooden food boards that fit the drawer. Lastly, just cut out the hole in the board to make sure you can fit the basket. Well, as I‘ve mentioned, this one requires a bit of handy work. If you want to transform your kitchen‘s design to a whole new level and do it with style, here is a lovely idea! Get some rectangular plastic or wooden boxes and wrap them in beautiful fabric. Use glue to attach it to the box and stack them up next to each other in the drawers. You can keep your cutlery for special occasions right there! This is a very simple but gorgeous organization idea. Actually, you don‘t need to only use it in the kitchen! Feel free to incorporate it into other areas of your life too. Feel free to make your own chalkboard labels. 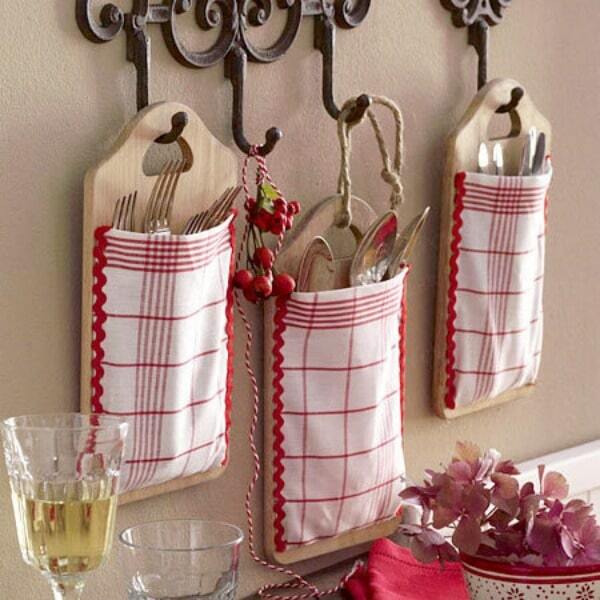 They look classy, suit pretty much any kitchen interior and help you to keep yourself organized. All you need is chalkboard labels and an erasable chalk marker. Here is a lovely bundle that has it all: 73 chalkboard stickers and a white chalk marker. Do you know what‘s the best thing? You can reuse them, so you‘re not stuck with the same labels. A fridge has all this space that can be used for storing some of the lighter things like a kitchen towel. This space can be essential to someone who has a small kitchen. While you can buy a holder like this one, it might be more fun to make one yourself. Improvize, create your own holder so that it does exactly what you need! Make sure it‘s not too heavy though and finally attach a few powerful magnets to the holder. The stronger, the better, you don‘t really want the whole thing to go up and down all the time. 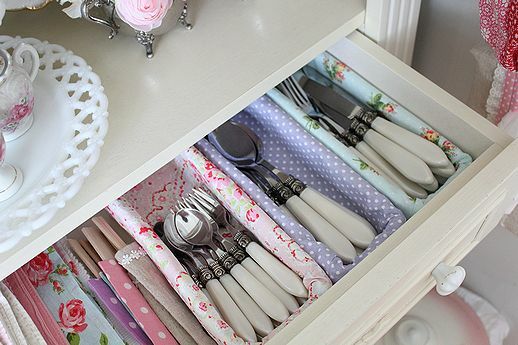 When I saw this beautiful DIY cutlery organizer, I thought it was genius! We all use canned products to cook our favorite meals. So, it only makes sense to reuse them in your own kitchen. Collect 6 metal cans, strip away all the labels and keep them in warm water. That‘s to make sure they‘re completely free of glue and paper. Scrub them and dry them out. The next step is to spray them with white paint. That‘s going to serve as a base color and make sure the real color you want to use comes out sound and clear. Do that will all the cans and get a piece of wood. Paint it the same color as cans (well or whatever you deem suitable) and glue them all together. Finally, attach labels (perhaps chalkboard labels I‘ve mentioned before?) and enjoy your new cutlery organizer! If you‘re good with wood, you‘re going to love this idea. However, if you have no idea how to work with wood but have a few cutting boards and a few deep wooden boxes with open tops, try this idea. Paint the boards and boxes the same color and glue them together. Then, just hand them on your kitchen walls and fill them up with either cutlery or other essentials. 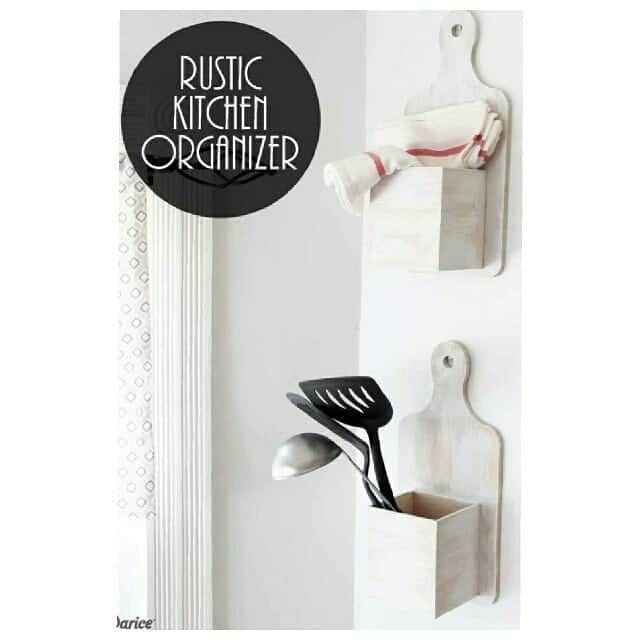 One thing for sure – these hanging organizers look nice! 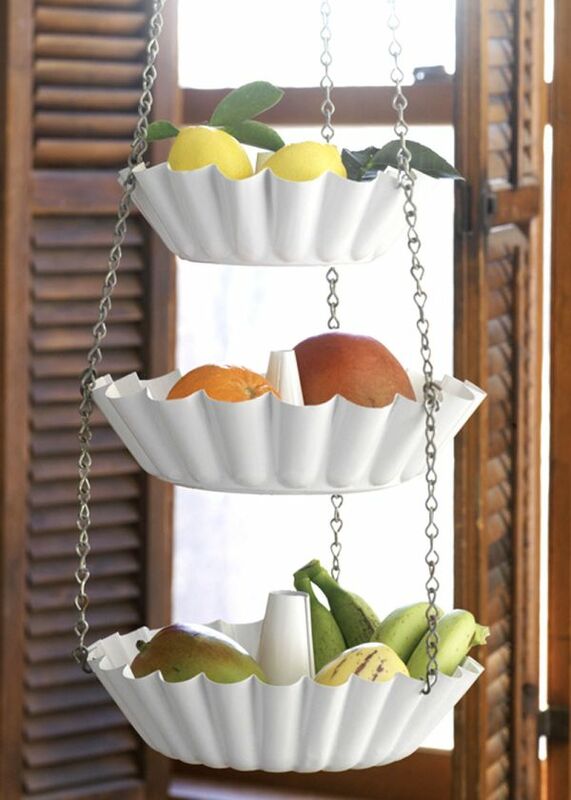 3 containers and a metal chain – that‘s all you need to create a hanging storage unit in your kitchen. 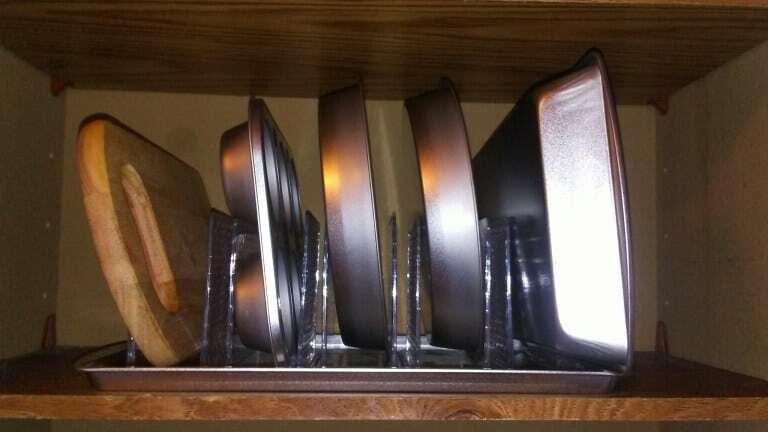 Get 3 baking pans and make sure they‘re all of the different size. The key here is for them to be sturdy. Since you‘re going to want to make holes in the corners to hold them up. Truly an interesting idea you can try at home! You can never have too much storage space when it comes to your kitchen. If you‘re like me and always look for a cheaper way to get things organized in your kitchen, you probably know what Dollar Tree store is. 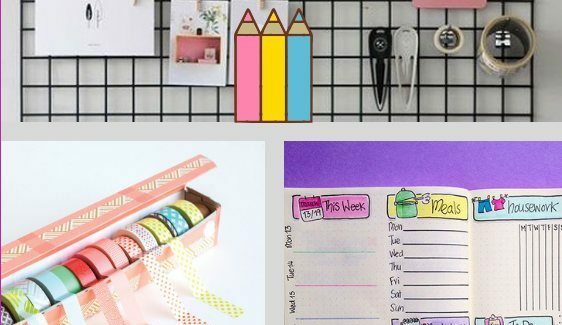 In fact, I have the whole article on Dollar Store organization hacks, so feel free to check it out. Anyway, this DIY organizer is made out of Dollar Tree store materials. 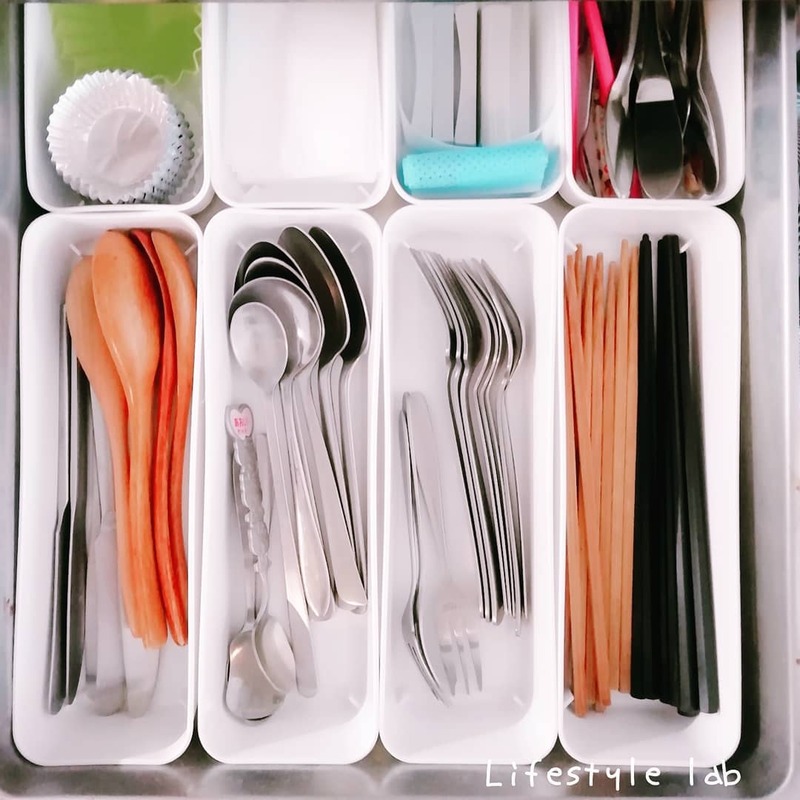 It‘s a simple but cheap organizer that you can use to organize things under the sink. Keep it anywhere you want: hidden or out on display. Simple, rectangular boxes like these ones here can do the trick when it comes to organizing all your cutlery in the kitchen. If some of your bigger drawers are an absolute mess and have a few small things in them, getting plastic boxes will do the trick. Make sure you fill up the drawers fully so that boxes don‘t keep on sliding. 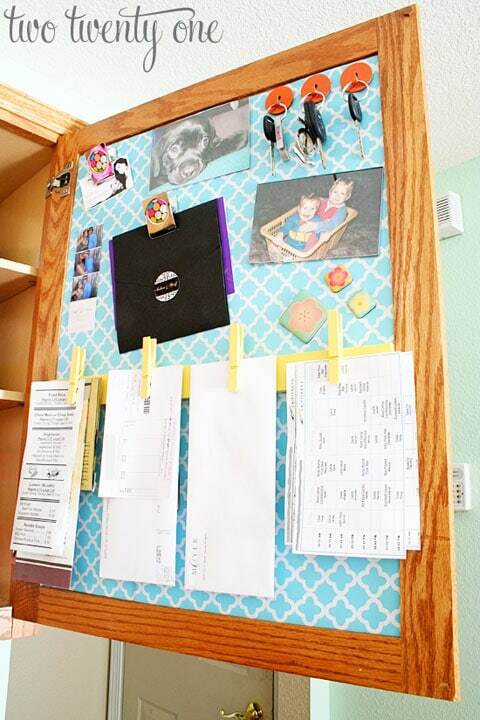 Here is another Dollar Tree organizer idea. For this one, you‘ll need 5 napkin holders, cookie sheet and glue. 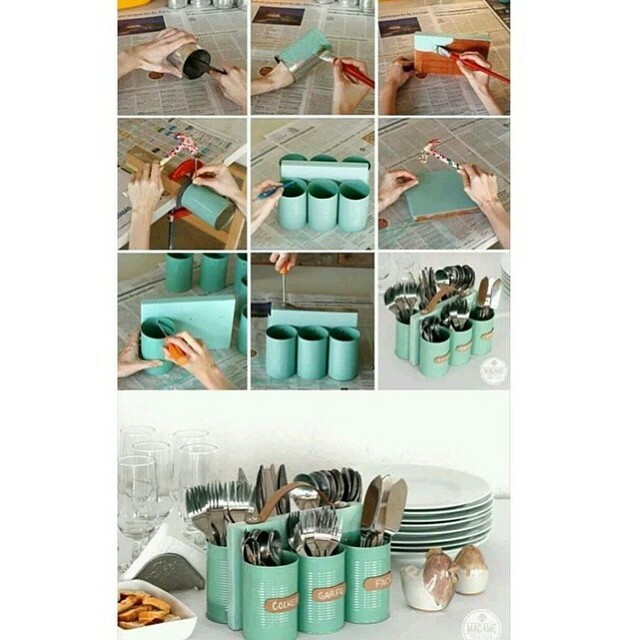 Align all the napkin holders next to each other and glue them to the tray. Let it dry and make sure the organizer is sturdy. Use it to keep all your pans, baking trays and cutting boards organized. Hey, you won‘t need to take out all the stuff out of the shelf just so you can reach the pot you need! I‘ve already mentioned this amazing hack in my article about fridge organization. Since the idea is so great, I thought I‘d share it here too. You‘ll need tins like these ones here, some spray paint and magnetic adhesive sheets. These ones are good enough. Spray paint the tins, let them dry and glue the magnetic adhesive sheet to the tin and you‘re good to go! Feel free to label the tins and attach them to your fridge or any other metal surface. These are great for keeping small bits and bobs. 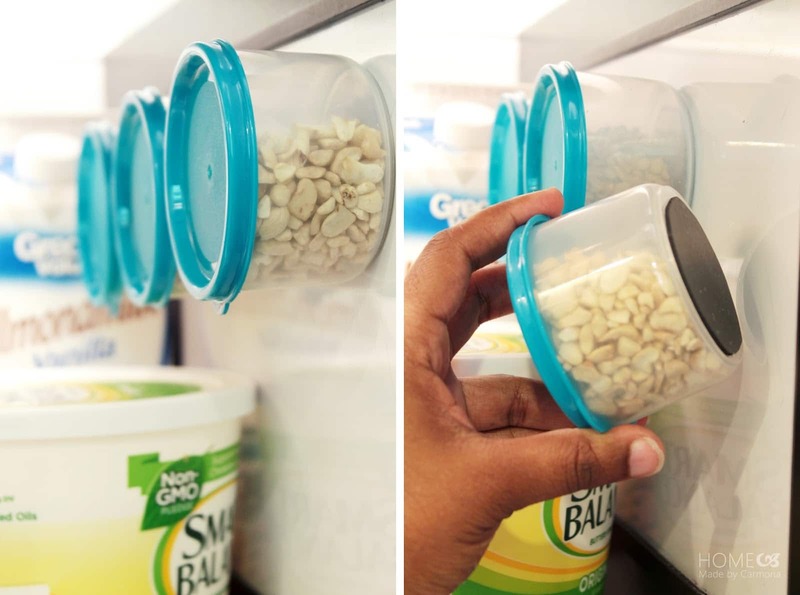 Also, you could store nuts, teas and other dry products in them. Here is another little idea for using your cutting boards for more than just cutting. Get some fabric with beautiful ornaments: something thick that would be able to hold the pressure. 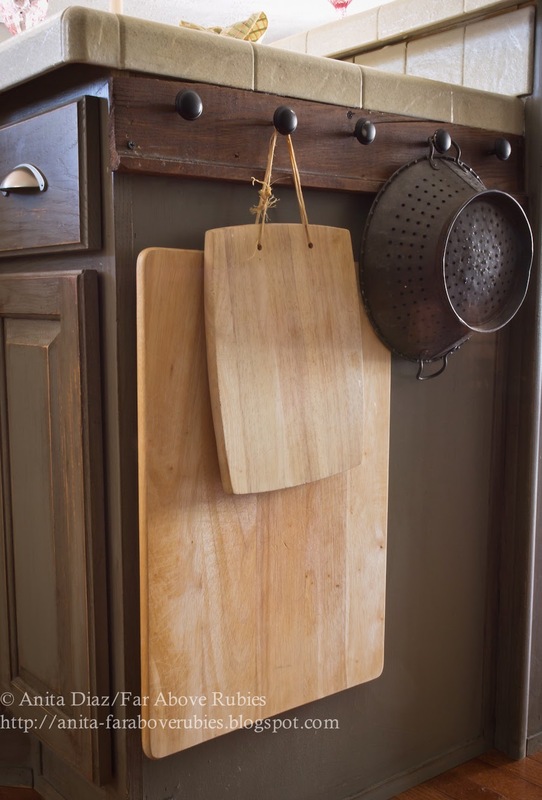 Glue the fabric to the board, hang the board and feel free to store your cutlery there. Looks fun, never gets boring and very simple to make! Hands up if you never use the space under the cabinets to store items! Well, perhaps you want to change that? Here is a beautiful storage idea for your kitchen – magnetic jar rack. 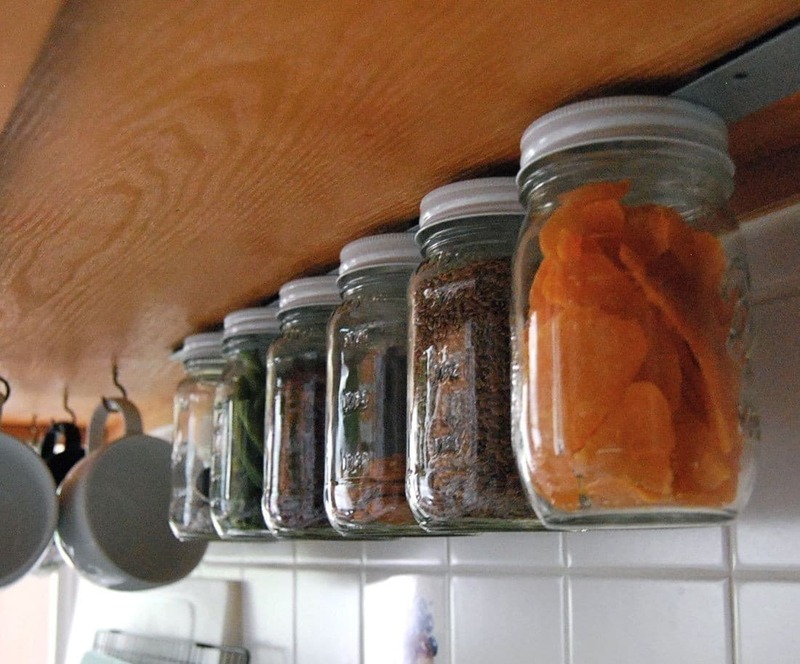 Mount a magnetic strip under the cupboards and feel free to attach your jars to it! Jar lids are metal, so they‘re perfect for that. However, make sure that the jars don‘t get too heavy! You don‘t want any accidents with glass! 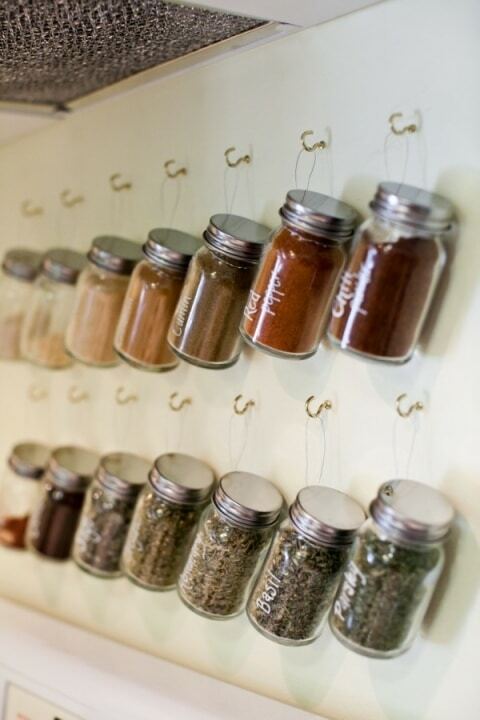 Here is another lovely kitchen organization idea for those who have loads of spices. For this one, you‘ll need glass spice jars, wire, wire cutters, paint pen, and wall hooks. Loop the wires over each jar, make sure you do it well enough so that the jars can hang on it. Then, install the wall hooks and hang all your jars on them. You can use the pen to label the jars. 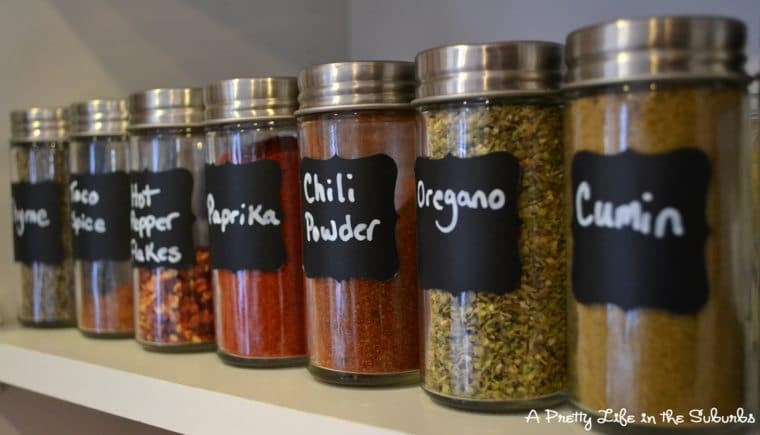 It‘s a great idea if you no longer have space for your spices. Because you can always find some space on your walls to hang these! 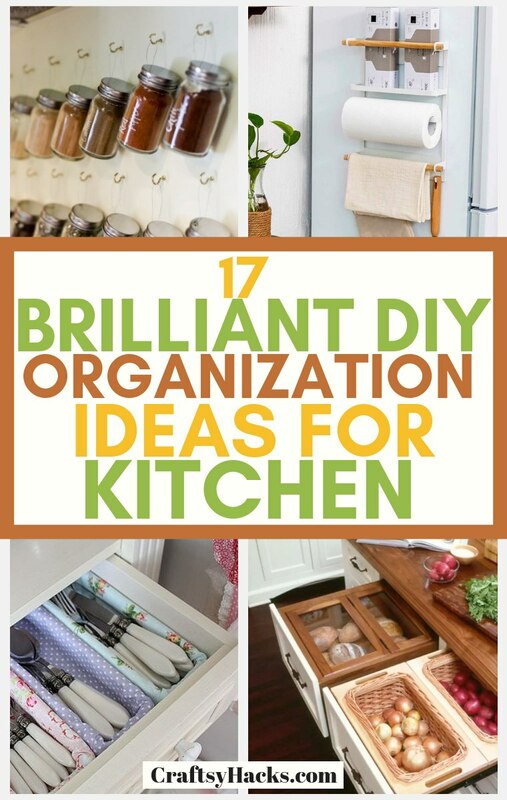 I hope you‘ve enjoyed some of these DIY kitchen organization ideas! Do you have any ideas of your own? Share them in the comment section! Otherwise, feel free to read other articles on how to organize your desk, get more storage in a small room and keep your beauty products organized.